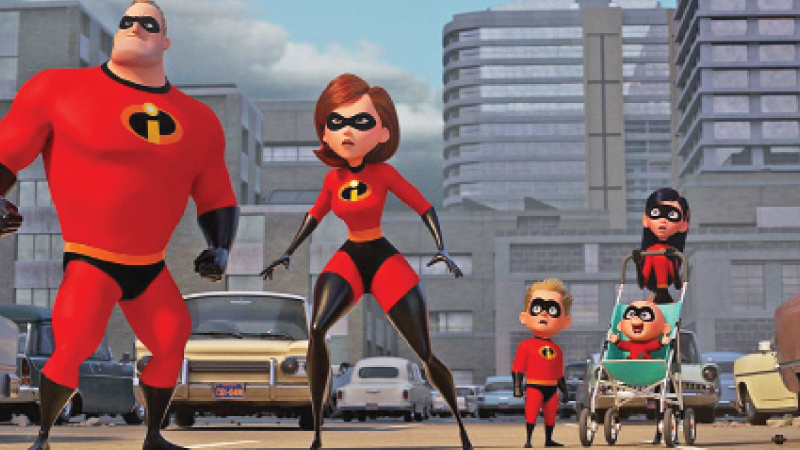 Incredibles 2 starts off where the first movie leaves us. Unfortunately, the people have not immediately welcomed back Supers like you might expect. They see carnage and suffering left by Syndrome and look for someone to blame in the Supers. This leaves the Parr family in a tricky dynamic of having a newfound confidence in their powers but living out of a hotel without a way to support each other. One day a businessman named Winston Deavor approaches them with a seemingly perfect solution. He wants to use Elastigirl as a spokesperson for a movement to bring the supers back out of hiding. This requires Helen to go away from the family but it provides housing, employment and a way to help their family and others be their super selves. Helen Parr: [to Bob] You know it’s crazy, right? To help my family, I gotta leave it to fix the law, I gotta break it. Bob Parr: You’ve got to, so our kids can have that choice. (They are both being the best parents to their kids. One has to leave to find work and the other has to deal with the day to day problems). This is where we get to the real cream of Incredibles 2. 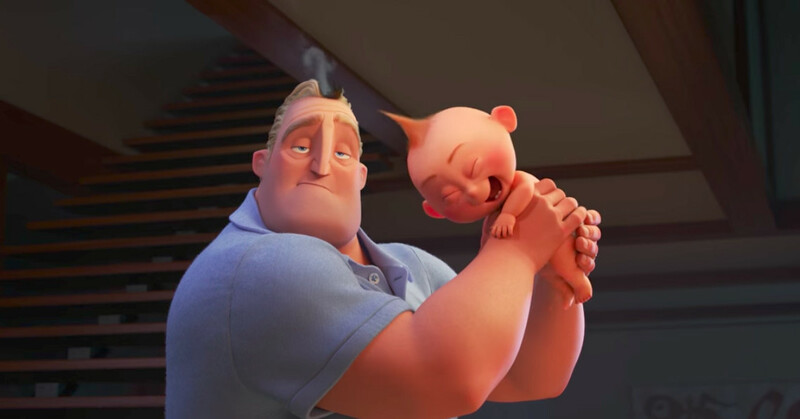 Bob must figure out how to solo parent for not only his 3 children but 3 special children including baby Jack Jack who has over 17 powers he can’t control. The scenes with Bob and his kids brilliantly show the exhaustion of parenting especially with an infant. It oddly made me think of the movie Tully and how exhausted Charlize Theron’s character is when carrying for her new baby. What separates Bob, however, from a lot of movie Dads is he both struggles and succeeds. For example, Dash has the new math (which is totally a thing), and Bob is overwhelmed but eventually they figure it out. Violet is angry with her Dad and he messes up but then they have a really sweet moment where she tells him he’s doing a super job and let’s him sleep for 17 hours. This made Bob’s story feel human and relatable instead of just mindless slapstick. 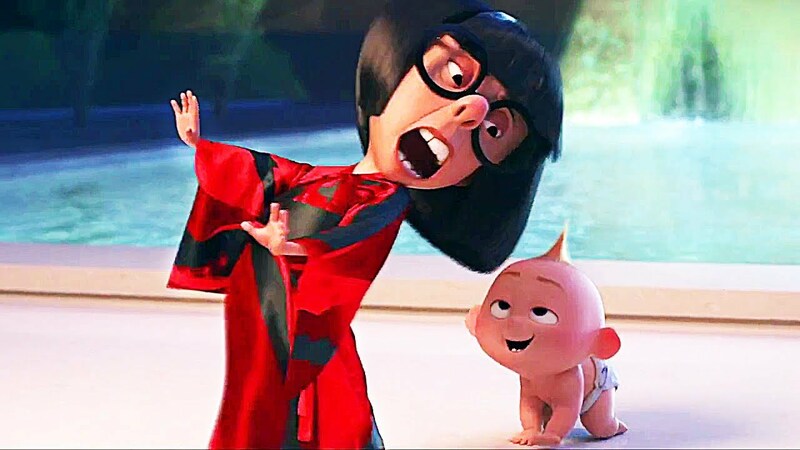 The highlight of the film is when Bob takes Jack Jack to meet Edna Mode and she turns out to be a better parent than we might expect. After all it takes a village to raise a child and that is certainly true with Jack Jack! I also appreciated how Incredibles 2 allowed the kids to be empowered without turning them into mini-adults like other franchises do. Violet and Dash use their powers to help save their parents but only when they have to. They still need their parents for love, guidance and protection. It was very well done. 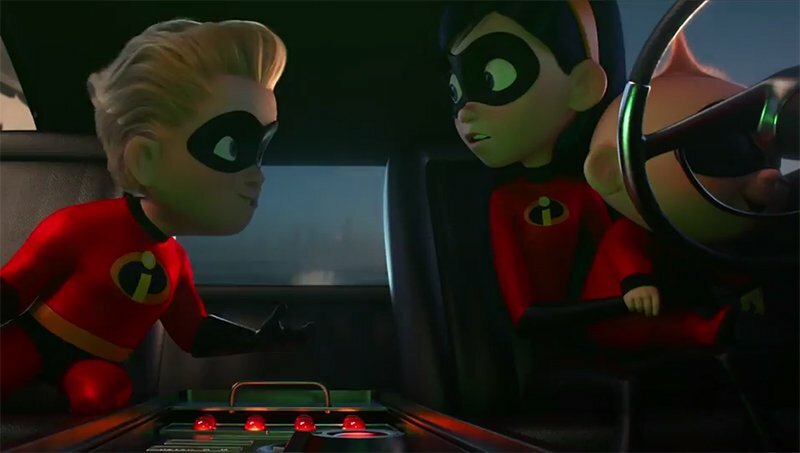 Some of the elements in Incredibles 2 are pedestrian like the predictable villain but it is surrounded by such engaging fast-paced action, quippy dialogue and striking animation that I didn’t care. Not every part of every movie needs to reinvent the wheel for things to work. Plus, the standard superhero segments still gives us a ton of new characters with fun super powers like Voyd and Brick. Frozone (Lucius) also gets much more screen time and dialogue, which was a delight. There are other messages hidden inside of Incredibles 2 like our dependence on technology and the way we are pitched glossy showcases of progress without real change being made but my main takeaway was a reminder at how difficult parenting is. How it takes the best out of even superheroes but in the end it is worth it. Loving families and children growing up to be the best version of themselves is worth it. I’m not even a parent but I think that is a fantastic message and something we need to see more in film. So many parents are either shown to be demanding jerks or idiots that this is not as common in film as you might think. 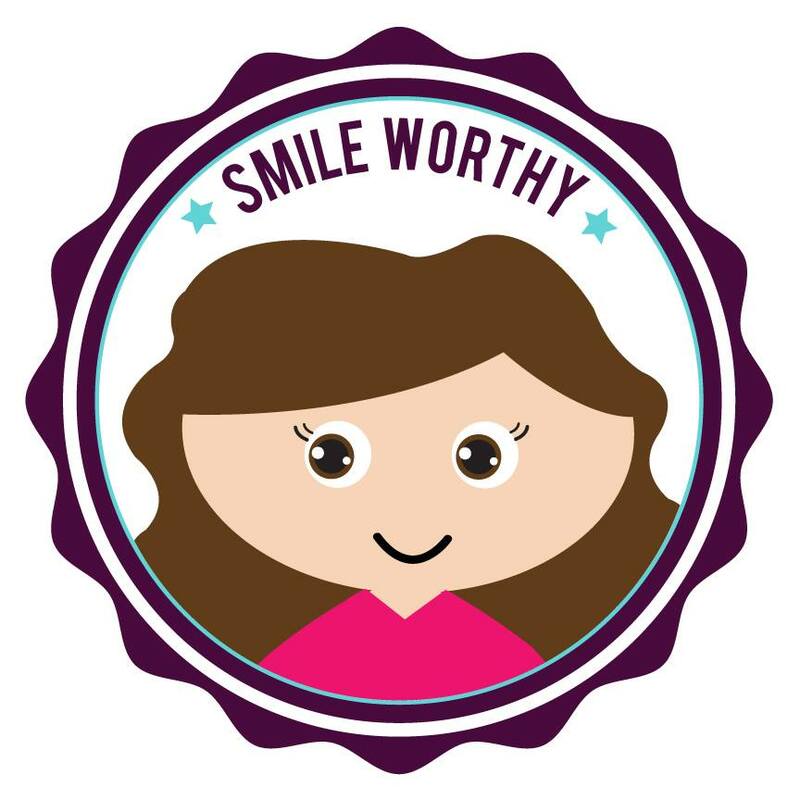 Most parents are trying as hard as they can and if they get frustrated by new math or a baby that won’t sleep let’s all try and help them out as much as we can. They are the true superheroes! While I found the first half a bit slow, I did end up loving this film more than the original (which I wasn’t ever that big a fan of). I loved the villain even though I guessed the twist about midway through, but it’s still my favorite Pixar villain! And I wasn’t too fond of the whole “memory forgetting” of that one character, but I did enjoy the other characters. Great review. I agree with pretty much everything you said. And you phrased it so well by saying that Bob both struggles and succeeds as a parent. That was a really cool, and realistic, thing to see. I am surprised to hear that Bob’s segments of this movie weren’t just “dad is a failure and an idiot”. From the previews, that’s what it looked, like and it made me extremely unenthusiastic about seeing this movie, despite my love of the first one. To hear that he’s portayed decently is a genuine relief – now I’m excited to (eventually) get to see it. Thanks!